Welcome! We’re happy you’ve stopped by, come and take a look around our website – you’ll find information about the services and activities we run for people across Widnes and Halton as well as information about what we believe. 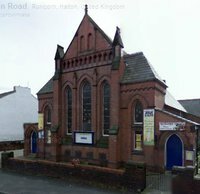 You don’t need to have ever stepped into a church before to attend one of our services or activities everyone is welcome at Widnes Baptist Church. Although our church has stood for over 100 years it remains alive and growing. We welcome people from all walks of life so please feel free to come with any questions you might have. Our normal Sunday Service starts at 11am and finishes around 12.15pm – with free refreshments afterwards. The service usually contains a worship time with modern songs and traditional hymns, prayers followed by a sermon/talk. Communion is included regularly. Part way through the service children can leave to take part in their own Kids Group (Sunday school) an exciting time with craft, games and stories. For more information please check out Activities.